Roundworms have a significant effect on Mohair production and is the biggest health issue facing the Angora goat. Angora Goats metabolise anthelminthics at a much faster rate than sheep and so roundworms develop resistance to the drugs at a more rapid rate than in sheep. New active ingredients for doses are unlikely to be developed in the near future and due to the quicker development of resistance in goats, drug companies are not likely to register any new doses for goats. Vets will often advocate dosing goats at 1.5 to 2 times the sheep dose (off license) due to the rapid metabolism of the drugs in goats. Every farm is different and resistance levels will depend on previous management strategies. Resistance may come to your attention when Post Mortems or Faecal Egg Counts (FEC) have been conducted by your vet. To check for dose resistance on your farm, do a Faecal Egg Count Reduction Test (FECRT). Take a pooled faecal sample from about 5 marked goats. Keep the faecal sample in the fridge and get your vet do a FEC (faecal egg count) within 48 hrs. Dose with an anthelminthic if indicated, recording the product used. Take another sample from the same marked goats 10-14 days later and have a FEC done by your vet. Any roundworm eggs that are found in this second sample must have come from worms that survived the anthelminthic dose as it takes at least 18-21 days for ingested infective L3 stage larvae to start producing eggs. Excessive dosing. Avoid this by doing regular FEC and dosing only when indicated and implementing holistic management strategies, See THE BIG FIVE below. Under dosing. Dose according to the heaviest animal in the group. Check with your vet or drug company representative vet whether the off-license dose for goats is higher than that for sheep. Off licence – Most doses must be given at 1.5 to 2 times the dose that is recommended for sheep due to the difference in the metabolism of the goat. Check with your vet or drug company. Introducing other farmers ‘super-worms onto your farm. Quarantine newly purchased stock and dose all animals with an effective “clean-out “dose. Do a FECRT 10-14 days after the quarantine dosing. Long acting drug formulations. These will cause rapid development of resistance in the same way that repeated dosing with the same active ingredient will do. Dosing the whole flock and moving them onto a new pasture. This has the same effect of increasing the resistant proportion of the worm population as with dosing in winter and should therefore naturally be avoided. “Refugia” has proven to slow down the development of anthelminthic resistance by maintaining an anthelminthic-susceptible worm population on the veld/pasture. Studies indicate that there needs to be at least a 10 fold dilution of resistant eggs to maintain the effectiveness of a dose in a flock. If an anthelminthic dose is 99 % effective then 10% of flock needs to be left untreated. This rises to 34% if a dose is only 95 % effective, in order to maintain a 1:10 ratio. This can be achieved by TST (Target selected Treatments) where not all animals in the flock are dosed. The FAMACHA dosing system is a good way of implementing this and maintaining “refugia” and a means of identifying and culling animals that have a poor worm resistance. Under certain circumstances such as kids on pastures where a farmer feels the need to dose all the animals, the dilution of resistant worms is maintained by running untreated adult goats with the kids. Adults are considered worm neutral when running with kids as they remove larvae and deposit eggs at an equal rate. A holistic management strategy needs to be followed and has been given the name “The Big Five” by Prof Gareth Bath which can be used on Angora goat farms in South Africa. Sustainable, holistic internal parasite management. We have concentrated for far too long on anthelmintic resistance and not enough on the immunity of the Angora goat. The immunity of individual animals can be influenced by multiple factors. Normally about 5% of infective L3 stage larvae establish as adult worms but this increases to 30-40% during late pregnancy and lactation when ewes are under stress and their natural immunity declines. Selection for certain production traits in Angora goats in the past may have inadvertently led to decreased immunity in some animals. It is interesting to note that fibre diameter (fineness) has been correlated to higher worm burdens (poorer worm immunity) in sheep so we would expect the same would be likely to apply in goats. There are several important genetic issues to note. Heritability of resistance and resilience in various investigations vary around 0.25 – thus it will take several years to reap the benefits of this selection process. Since rams contribute 50% of the genetics yet in most breeding systems only comprise 2-4% of the breeding flock they have a huge influence on the genetic direction that is taken, and thus strict selection for the ability to withstand helminth infection and its results is imperative to make worthwhile progress in as short a time as possible. Culling of ewes is based on Targeted Selective Treatment (TST) results. The worst performers, that seldom make up more than 5-10% of a flock (van Wyk,2008), can be identified by Targeted Selective Treatment (TST) and especially the Five Point Check which is practical, cheap,quick and effective in identifying candidates for culling (Bath andvan Wyk, 2009). By getting rid of the worst animals that cannot cope with infection without frequent treatment, the frequency and need for blanket treatments of all goats is significantly lowered or eliminated, with the inherent cost savings, but culling will also assist with genetic improvement in the flock. Advisors can assure farmers that they will see the benefits if they persist with implementation for 3-5 years. Especially protein and trace elements are needed to support immunity. For immunity to develop, this is essential – a balance between parasite and host must be sought and maintained. We cannot expect that the goats will develop and maintain satisfactory immunity in the absence of sufficient parasite challenge. Goats suffering from other diseases will have a lowered ability to cope with concurrent helminthiasis. These must be in place when animals are brought in from elsewhere so that resistant worms are not introduced to the farm at the same time. Depending on climate, and season it can take a week to several months for larvae to hatch, then progress from L1 to L3 stages and become infective. The shorter the period of grazing, the less the chance of a severe build-up of infective larvae. If length of stay cannot be reduced then pasture contamination can be lowered by reducing the number of animals per unit area. Where possible, this will remove infective larvae during grazing of plants by a species not susceptible to sheep and goat parasites (Horak, 1981). Horses, cattle and ostriches have been used with success for this purpose. Examples are grassed pens and leaking water troughs. This factor is frequently overlooked and is especially important in areas with a dry climate. Under South African conditions goats are often kept in small paddocks every night to prevent theft and predation. If these security pens are grassed, the risk of severe helminthiasis is unavoidable without the removal of grass from all holding and security pens. The risk for parasite transfer depends in part on pasture height. It is well known (Kreceket al., 1995) that the infectivity of a pasture decreases in a logarithmic fashion as the length of a pasture increases. Short-cropped pastures may indicate high and efficient utilisation, but they also carry the increasing risk of high levels of infection by helminth larvae. In South Africa, kikuyu grass (Pennisetumclandestinum) forms a dense mat of stolons that are conducive to parasite survival and infection, particularly the most dangerous H. contortus. The angle of a pasture affects run-off and thus the suitability for larval survival. Paddocks with good drainage carry a lower risk of severe parasite infection than flatter, poorly drained paddocks. This is attributed to moisture retention and thus larval hatching and survival. In the southern hemisphere, south-facing slopes get less direct sun and are thus cooler so that they retain their moisture longer and are more suited to parasite survival, both of eggs and larvae. Extra water on pastures can dramatically alter the parasite survival picture and has turned “safe” farms into “dangerous” farms. Parasites adapted to cooler conditions (notably Trichostrongylusspecies) are becoming much more important in areas formerly dominated by H. contortus, and vice versa. In some cases this may have an influence. Heavy, clay-rich soils retain moisture and are thus more prone to favour larval survival. Monthly or bimonthly egg counts are very useful to monitor the infection rate onto the pasture, but less useful in indicating the parasite burden in the goats, other than young, susceptible kids. To make these checks practical and economical for farmers, pooled samples must be used. The farmer takes several pellets from each goat Equal samples can be placed into a plastic bag together, or if preferred, in separate bags and kept cold before being examined by their vet. The Faecal Egg Count (FEC) is the average and represents the pasture contamination rate. What constitutes an acceptable FEC for one parasite (say H.contortus) will represent an unacceptable situation in others (say Trichostrongylusspecies). Regular sampling and recording of bulk FECs does give an indication of the situation and changes that may occur. FEC reduction tests (FECRTs) or other measures are essential to ensure that the drug used is working well enough, and to monitor any serious deterioration in efficacy so that the use of a drug can be stopped before its usefulness is seriously compromised. The bulk FEC is an indicator of the level of efficacy. Using TST like the 5 POINT CHECK, weight changes and the “happy factor” are useful and practical for assessing the state of affairs regarding parasite impact (Mahieuet al., 2007; Bath & van Wyk, 2009; Cringoliet al., 2009; Greer et al.,2009; Kenyon et al. 2009; Stafford et al, 2009). 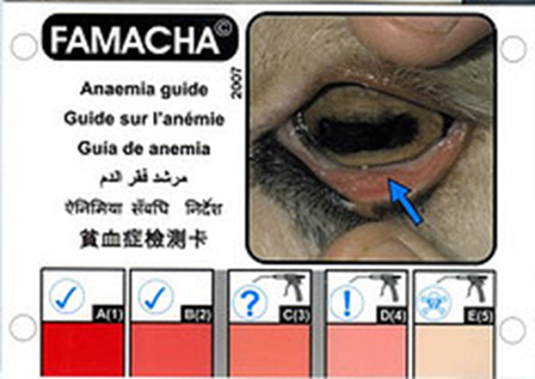 The most extensively researched and proven component of TST is the FAMACHA system of clinical anaemia assessment (van Wyk& Bath, 2002). Drugs are important, in many cases absolutely essential, but need to be used rugally and effectively if their useful life is to be extended. Time and again, the emergence of Anthemintic resistance can be traced back to prolific, inappropriate use of drugs. The FIVE POINT CHECK is a simplified extension of the FAMACHA system for use against other major parasites,and is gradually gaining acceptance (Bath and van Wyk, 2009). Read the label, follow instructions and check the spectrum covered. Weigh the goat, set dose according to the heaviest in the group and check the gun for accuracy and repeatability. Target the most vulnerable (kids and lactating or heavily pregnant ewes) for special attention. It is largely these groups that will need more treatments and greater vigilance. Concentrating on them can reduce the unnecessary treatment of other groups that can act as parasite havens for refugia. Do not buy on cost alone and do not formulate (mix) own farm mixtures. Only registered drugs produced by reputable manufacturers and distributors should be used. There are claims for a variety of herbs, farm products and nostrums but none of these have been substantiated (Burke et al., 2009), also in South Africa (Malan,unpublished data) and since they have not been registered for parasite control, their sale or recommendation is illegal. There are no new drugs scheduled for introduction to the market in the short term. Due to the economic impact of roundworms this means the focus must be on management strategies of avoiding drug resistance and improving the immunity of the Angora goat.